This composite image shows color views of Pluto (right) and its largest moon Charon as they appeared on July 11, 2015 to NASA's New Horizons spacecraft ahead of a historic flyby on July 14. LAUREL, Md. — With less than 24 hours to go before NASA's New Horizons probe makes its close flyby of Pluto, scientists are already learning more about the dwarf planet than ever before, including the fact that it is bigger than previously thought. New Horizons' latest views of Pluto have shown the dwarf planet to be 1,473 miles (2,370 kilometers) across, making it the largest body in the icy Kuiper Belt at the edge of the solar system. 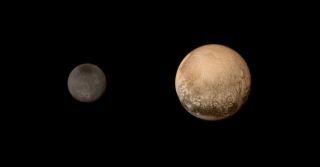 The observations also confirmed the presence of a polar ice cap on Pluto, and measured three of the dwarf planet's moons. As New Horizons closes in, the spacecraft made the most precise measurements to date of Pluto's size using methods similar to those employed by NASA's Voyager spacecraft. The new diameter of the dwarf planet makes it larger than fellow Kuiper Belt denizen Eris, which is 1,445 miles (2,326 km) in diameter. Previous estimates for the size of Pluto had put its radius at 1,430 miles (2,301 km). But Pluto now stands as the undisputed king of the Kuiper Belt. "This settles the debate about the largest object in the Kuiper Belt," Stern said. With Pluto's mass already known, the larger radius means that the dwarf planet is less dense than previously estimated, suggesting the possibility of an icier interior, though Stern stressed this was still under investigation. In addition to refining Pluto's size, New Horizons also measured three of the dwarf planet's five known moons. The spacecraft's observations of Charon, the largest, confirm measurements made from Earth of 751 miles (1,208 km). Nix is about 20 miles (35 km) wide, while Hydra turns out to be approximately 30 miles (45 km) in diameter. This image shows the approximate sizes of Pluto's moons Nix and Hydra as compared to the city of Denver, Colorado. The moons are depicted as circles here, but scientists say their true, irregular shapes will be revealed by NASA's New Horizons spacecraft after its July 14 flyby. The remaining two moons, Kerberos and Styx, are smaller and fainter. Their measurements will be taken during the flyby, and transmitted to Earth at a later date. Stern announced that the Pluto feature previously thought to be a polar cap has been confirmed by the ALICE instrument to consist of methane and nitrogen ice. The pole differs in composition from the dark features around the dwarf planet's equator. Later studies of a mysterious dark patch at Charon's north pole will be sent back starting this week. Stern also announced today that New Horizons spotted nitrogen escaping from Pluto's atmosphere five days ago — considerably earlier than the team had expected to make such a detection. The find suggests that Pluto may be losing its atmosphere more rapidly than previously thought, offering a tantalizing hint about its possible replenishment source. Another potential explanation for the distant source of nitrogen is that New Horizons followed a fortuitous path, similar to its flyby through the tail of Jupiter's magnetosphere.